Wooly Organic's First Gift Set makes a beautiful present for new parents. 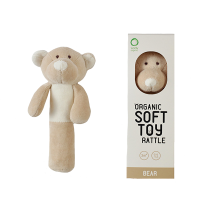 Made from the highest quality organic cotton so you can trust it contains no nasties, it is naturally antiallergic and super soft against baby's delicate skin. 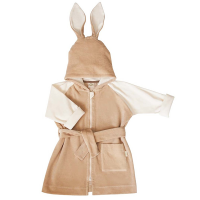 The set includes a sweet kimono style, long sleeved jacket in Wooly Organic's lovely bunnies and teddies signature print, soft velour pull-ups with a wide, soft waistband and footed to keep little toes cosy and snug and a matching dribble bib. The smallest sizes (56cm and 62cm) feature flip mitten sleeves which can be used to wrap over little hands to stop them from scratching. The natural unisex colourway makes it is suitable for both boys and girls. Available in sizes newborn (56cm), 0-3 months (62cm) & 3-6 months (68cm), the set is presented in a lovely gift box made from paper from FSC certified forests and printed with soy ink because Wooly Organic cares for your baby and the planet too! 100% Organic Cotton velour; Made in Baltic states (EU).